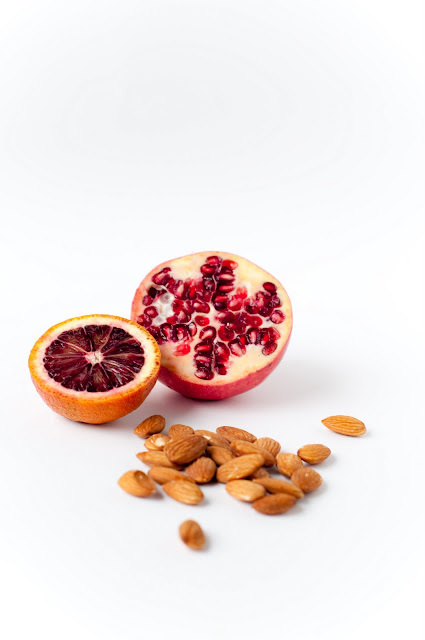 The first time that I made this orange, pomegranate, and almond awesomeness, I actually made little tartelettes for Valentine's Day. The recipe was sort of a complete amalgamation of whatever I had lying about the kitchen, which was, luckily, awesome winter pomegranate and citrus. I knew I wanted to make some sort of chocolate tart, and I literally grabbed the first ingredients that I saw and folded them in. Serendipity is such a wonderful thing sometimes. 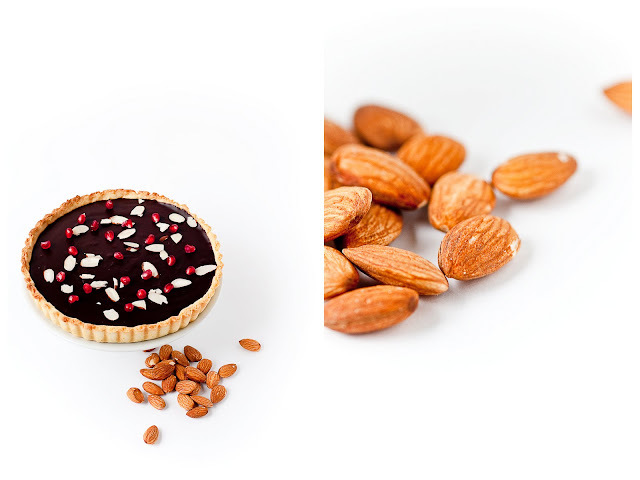 Once I had finished the tartelettes, I took a few as a trial run up to my weekly class in Berkeley. I watched silently in the middle of class as people slowly snuck bites out of their tartelettes, and their faces started lighting up. Ah! I just live for those moments. Anyways, after all of my tartelettes had been devoured over Valentine's Day weekend, I knew that I had to revisit the recipe and make one large tart for personal consumption. 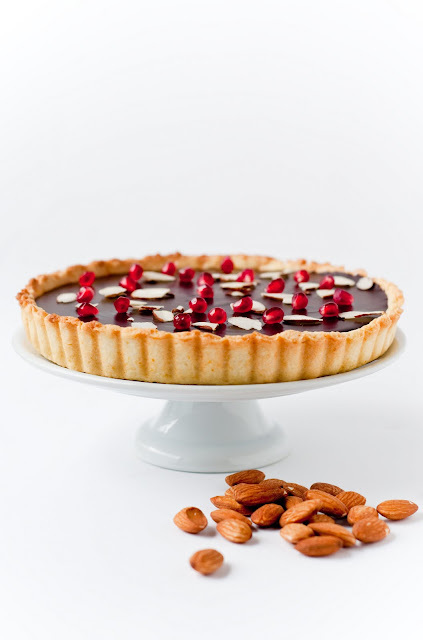 The super-flaky pastry crust here is infused with blood orange zest and almond extract, making for one extremely flavor-packed tart crust. 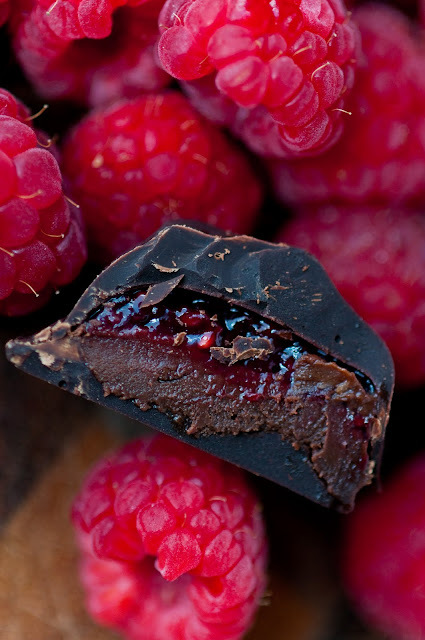 The dark bitterness of the chocolate ganache filling is balanced out by a hint of sweet pomegranate liquor. 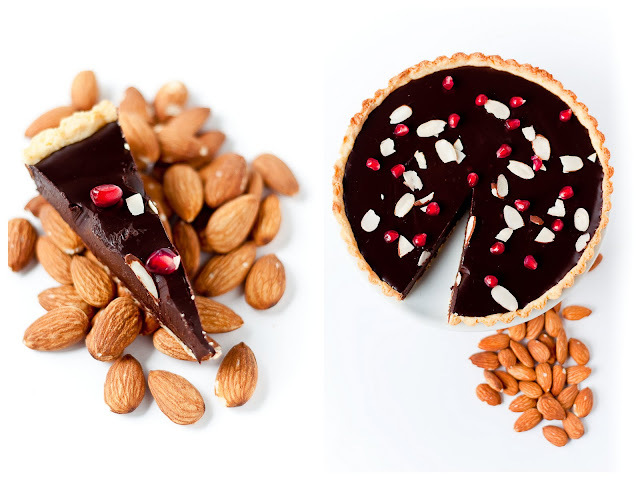 Put this all together, and you end up with a richly smooth and decadent chocolate tart that stores a burst of orangey and almondy goodness. Yes. Yum. As my roommate and I were enjoying this, we decided, in the infamous words of Paula Deen, that we should be arrested for eating such lusciousness for breakfast. 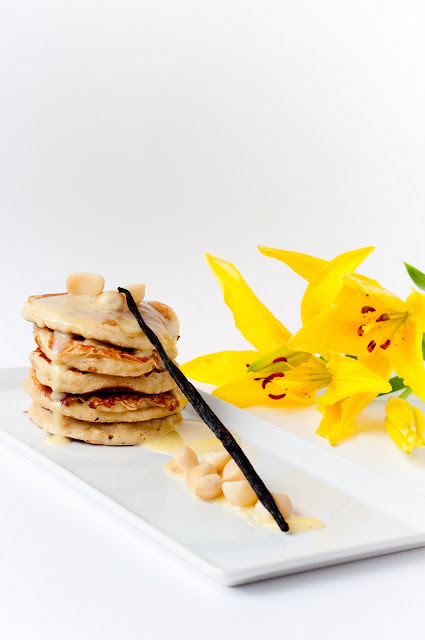 And, I tell you, luscious it was, with the fluffy tenderness of the banana pancakes (banana mash does wonders for pancake fluffiness!) studded with the buttery flakiness of the macadamia nuts. So good. 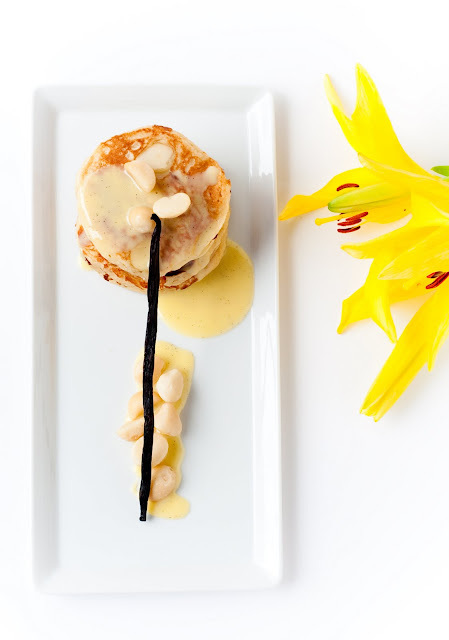 But, I think my favorite, favorite part of this pancake dish was the white chocolate creme anglaise. I ate it straight from the bowl with no regrets, a healthy diet be damned. 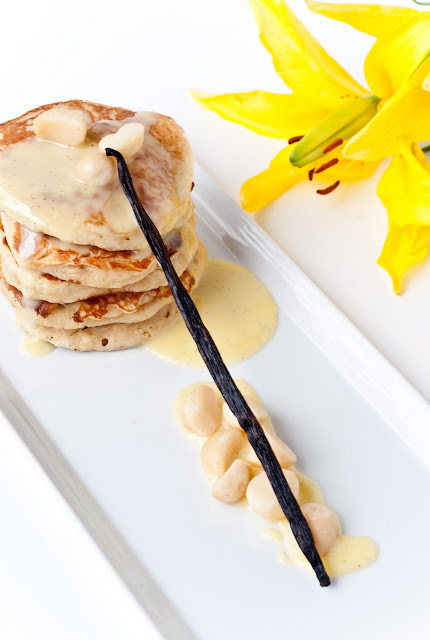 The white chocolate creme anglaise sauce, infused with fragrant vanilla bean, is just the right balance of rich sweetness without being overpowering. After this, I don't think I am ever going back to syrup on my pancakes. EVER. Here we go again-- I did it for Christmas and couldn't escape it for Valentine's Day: Chocolate Overload. Sooooo many chocolates. My head spun. Despite my best efforts at true, surgical cleanliness, there were wayward and unruly drops of chocolate everywhere, on every pair of jeans (and I have a lot of those), on the top ceiling of my freezer, on my chin. A lot. of. chocolate. 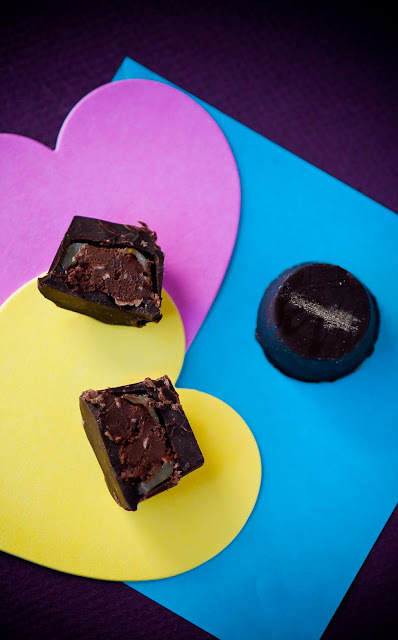 Probably due to the incredibly rainy weather and dreary days leading up to Valentine's Day this year, I was in a quite a tropical mood, which translated into these passionfruit-coconut-lemon dark chocolates. 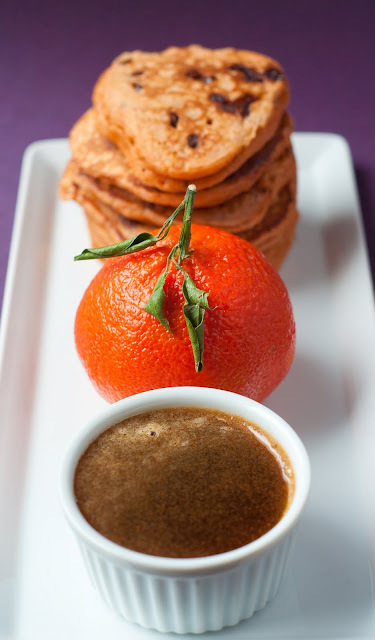 The ganache in these are infused with this ultra-concentrated passionfruit syrup that is available at Asian markets (like Ranch 99), spiked with rum, and then studded with unsweetened dried coconut for texture. 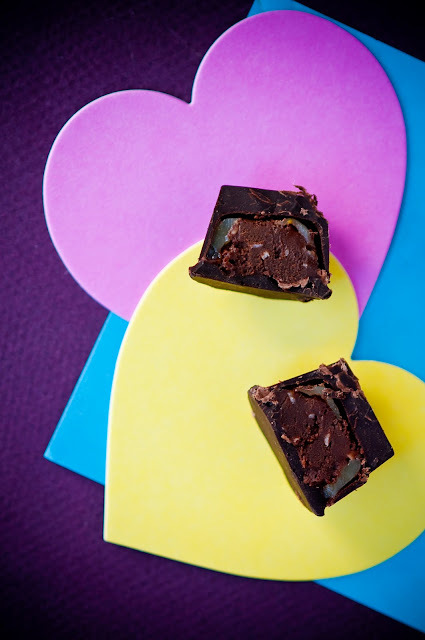 For a little extra something-something, I also filled the chocolates with a dab of meyer lemon curd, whose tartness played off the passionfruit flavor quite well. 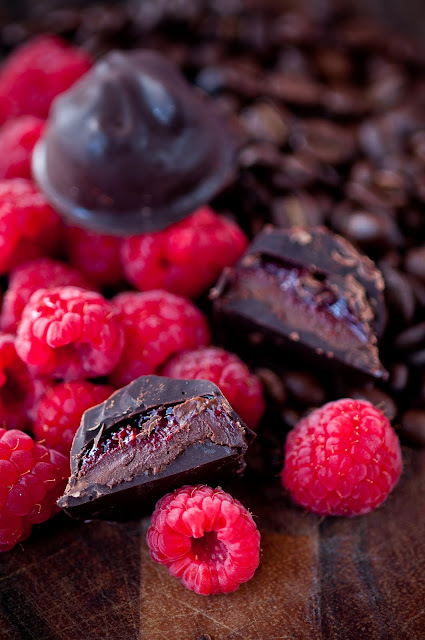 Instead of raspberry jam, these dark chocolates were packed with a freshly cooked down raspberry reduction that added so much intensity to their flavor. 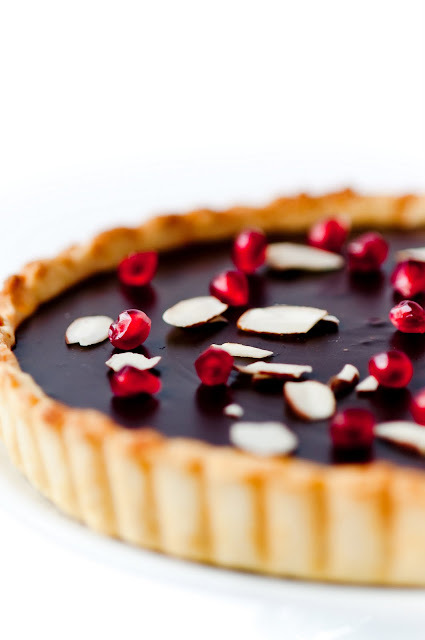 Then, coupled with the strong mocha dark chocolate ganache..... mmmm mm! Anyways, despite all of my grumbling about the amount of chocolate work I've been doing lately, I have been relishing this chance to experiment with all of these flavor combinations. I've got a few upcoming orders for chocolates, so I'm looking forward to trying some new ideas, too, and, thinking about working with chocolate transfer sheets. Go, chocolate-ty fun! 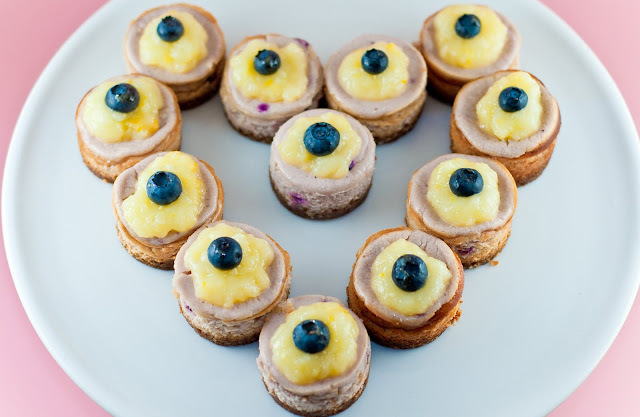 Oh man, I am so behind on posting Valentine's Day desserts--there's a huge backlog on my blog queue!--because my every spare minute has been going into catering a department Valentine's party yesterday (more on that in a few days). But now that it's over, I can finally catch up with the times! Ah, yes. Welcome to the digital age! Hehe, thinking up new messages for these conversation hearts were so much fun. How about some Twitter-inspired ones? (Though not pictured, I also had ones that said "RT me" and "DM me.") 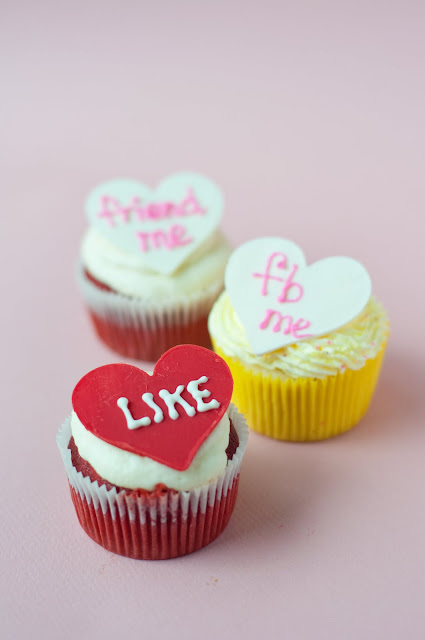 Or, some Facebook-inspired hearts? 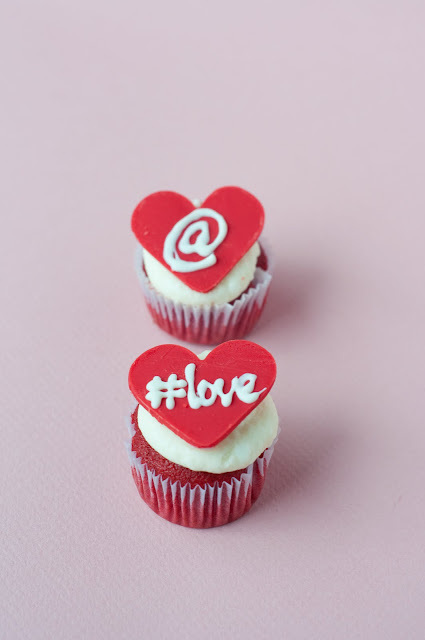 I had to also, of course, pay homage to one of my favorite tech sites, Gizmodo, with a <3modo cupcake. 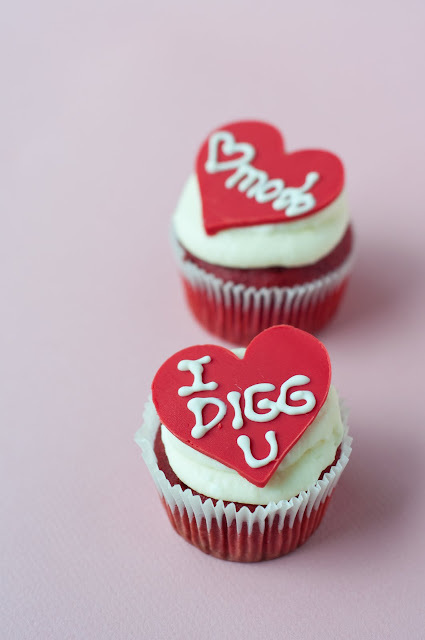 And, the "I Digg U" one is credited to Richard, who proudly came up with the whole tech-inspired idea in the first place. Of course, I also couldn't quite resist making a sideways dig at Apple, because, quite honestly, they really need to coin a better term for their video-output connectors than "dongle." Hehe. The conversation hearts are actually super easy and simple to make. They are made out of flavored couverture chocolate, and the hardest part is really the writing on the top. :-) Underneath, I made red velvet cupcakes with cream cheese frosting just because I love the bright red-ness for Valentine's Day. 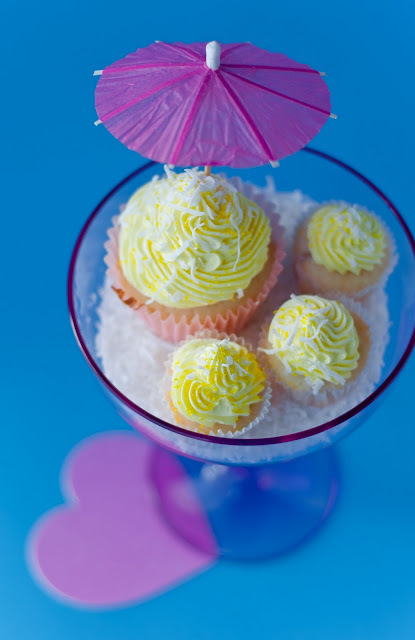 And, I made more pina colada cupcakes, too, because they are just so darn good. 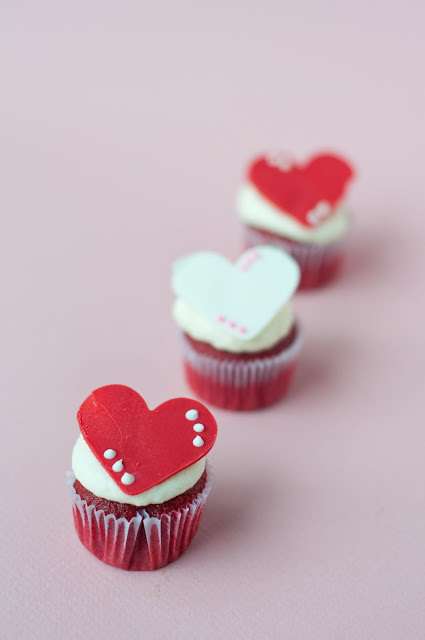 I hope you all have a wonderful and lovely Valentine's Day, full of sweet, yummy treats! 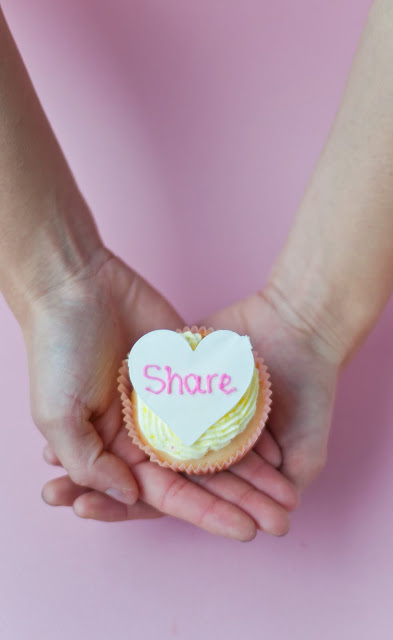 Read on for directions on making conversation heart cupcake toppers. 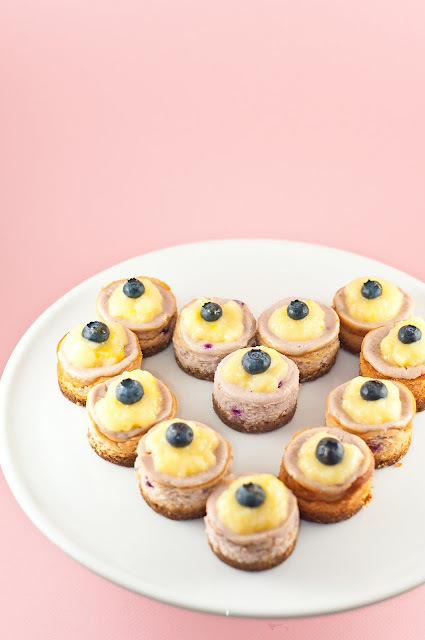 I wasn't going to post these until next week since they aren't very "traditional" Valentine's Day fare, but they turned out so damn good that they just couldn't wait! Hello, lover. Yes, okay, I apologize for that. But, misery loves company. Now that we have a soundtrack (of most arguably one of the worst love songs ever), back to more pleasant things. 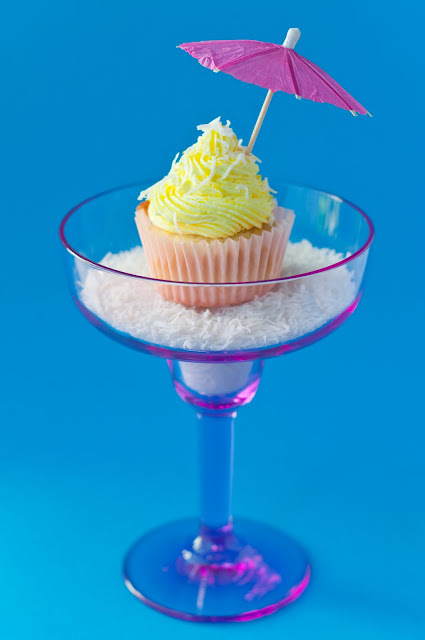 This idea of pina colada cupcakes has been floating around in my head for a while prior to execution. The original spark of inspiration, to give credit where credit's due, comes from my friend Toni, who I regard as one of my biggest dessert fans and who happens to be an amazing photographer. For Christmas, Toni got me Rose Levy Beranbaum's Rose's Heavenly Cakes, promptly opening the book to page 23, pointing, and saying, "I want to make that into a pina colada cake." A few weeks later (okay, the Christmas gift happened in mid-January), the pina colada cupcake was born (or baked, I guess, would be the more proper word choice)! 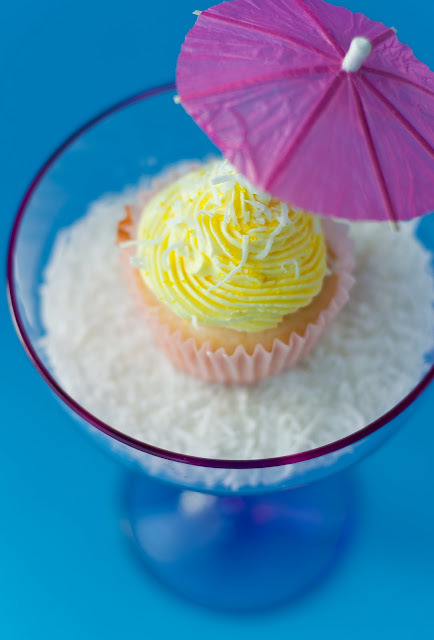 With a base of coconut cake, taken from page 23 of Rose Levy Beranbaum's book, and a liberal topping of Italian meringue buttercream flavored with freshly made pineapple puree, this cupcake is absolutely heavenly. And I am not kidding. It literally hurt me in the gut to give these cupcakes away to both the people who had ordered them, and, I have to confess, to Toni. I just wanted to keep them all for myself. The coconut cake recipe is really good and super coconut-y. 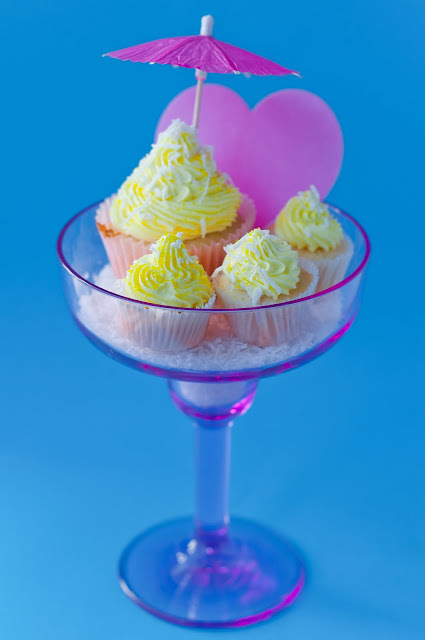 But what really makes these cupcakes for me, personally, is the fresh pineapple puree in the pineapple buttercream. You absolutely don't want to cut corners here and use canned pineapple. It's just not going to be the same. And fresh pineapple puree is easy to make. All it involves is cooking the pineapple down with sugar and water, draining away the liquid, and whizzing it through the food processor. The resulting puree is so good and light-as-air that I ate most of it fresh out of the food processor. It's better than any applesauce you will ever touch. Don't throw away the pineapple syrup, either! It makes a great base for homemade pineapple soda (just add fizzy water) or cocktails. 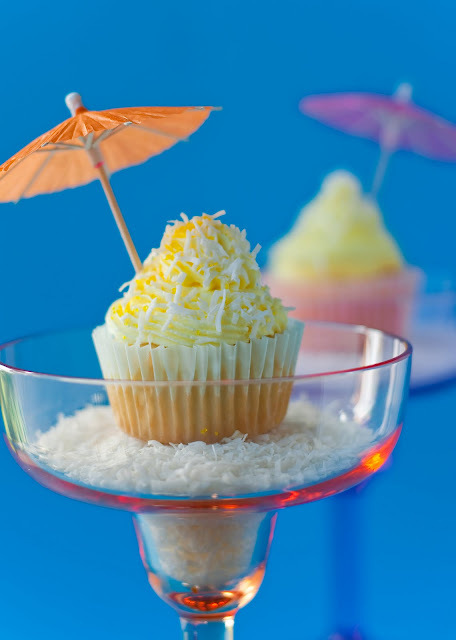 The punch of pineapple and coconut flavors in this cupcake linger in your mouth for a long while even after you've finished the cake, making you really, really crave more. I can seriously scarf down about ten of those mini ones in one sitting if I'm not careful. 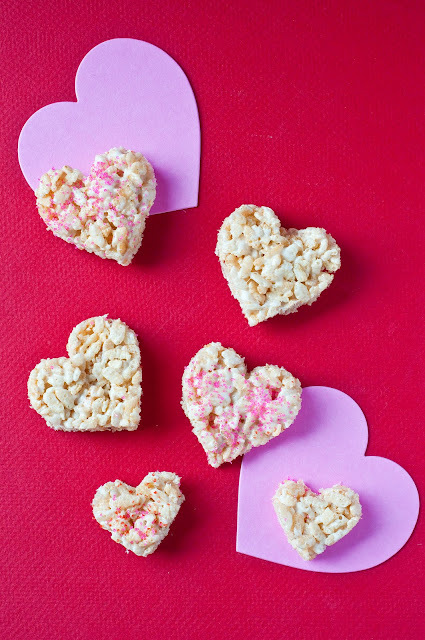 Trust me: make these for your Valentine. Despite not being made of the traditional chocolate, they are sure to impress. 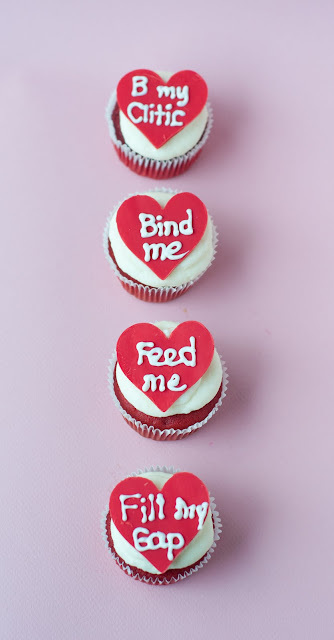 Oh, but a fair word of warning: you'll most definitely want to make an even number of these cupcakes. If you and your Valentine have to fight over one, it's not going to be pretty. (P.S. On an unrelated topic, a reader kindly brought to my attention yesterday that there was no obvious way to subscribe to this blog's feed located on the homepage--a gross oversight on my part! (Thanks, June, for bringing this to my attention!) I have since remedied this situation, and you'll find links at the top of the side bar -----> that can allow you to subscribe easily via your feed reader of choice (e.g., Google Reader) or via email (Thanks to my Adopt-a-Blogger mentor, Kristen, for pointing me in the right direction for this). So go subscribe! 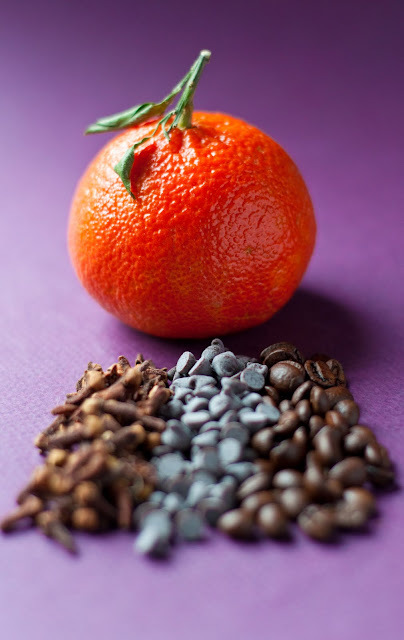 What do you get when you put together orange, clove, chocolate chips, and coffee beans? 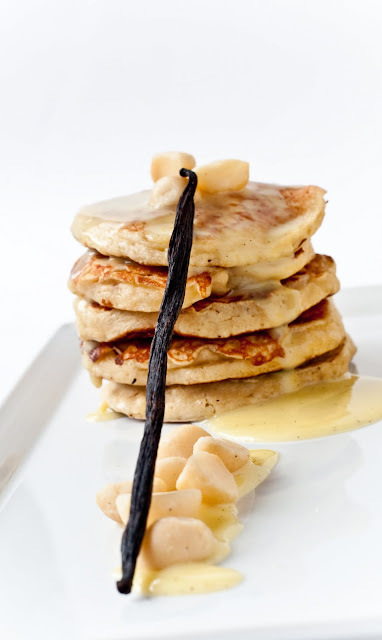 How about a morning wake-up call, in pancake form? 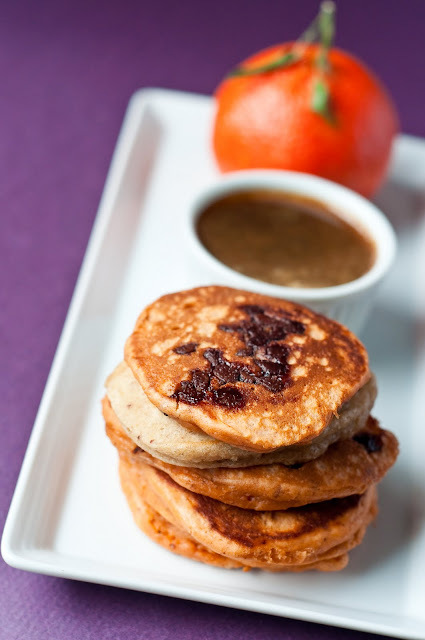 Say "good morning" to these orange-clove, chocolate chip pancakes, with a side of coffee-clove syrup. Yup. That's how we started our weekend here at the house, because *that's* how we roll. 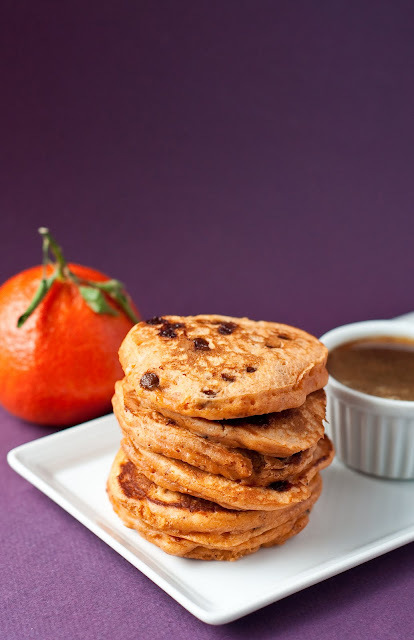 Given this overabundance of oranges that have been rolling about our kitchen table for the past few weeks, I decided to whip up some orange-flavored pancakes for breakfast this weekend. Since it's been cold and wet almost non-stop for the past few weeks, the wintery clove seemed to be a natural companion for the oranges. 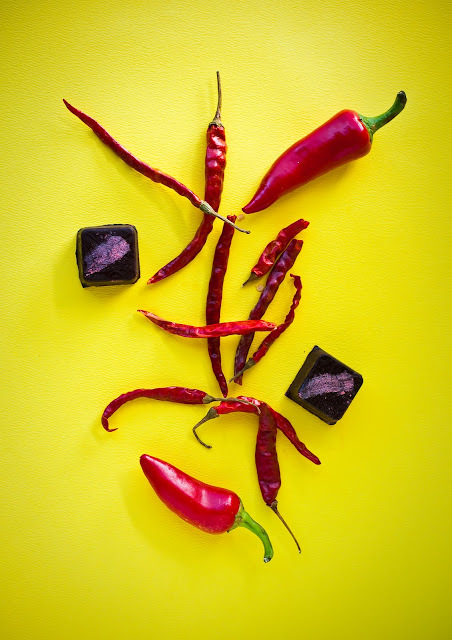 Then, my thoughts turned to chocolate--little hints of melty, gooey, sweetness--to go with the tartness of the citrus and the spiciness of the cloves. Finally, as I bent down over the mortar and pestle to get a whiff of the cloves, coffee suddenly popped to mind! 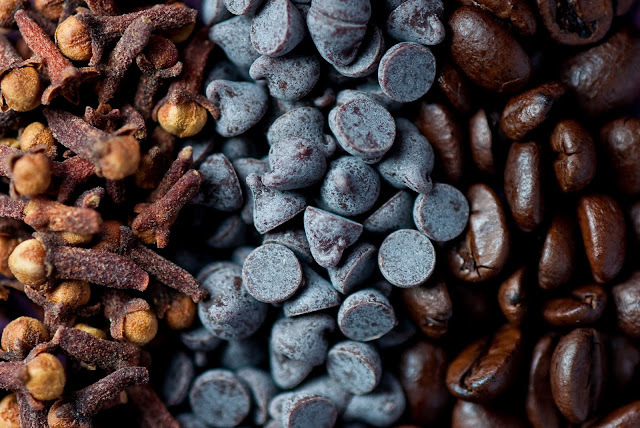 Now, I don't really drink much coffee, but the earthy darkness of a strongly brewed coffee would be perfect with the cloves, orange, and chocolate, so I whipped up a bowl of coffee syrup, adding a handful of whole cloves in to further tie together the flavors. The final result? 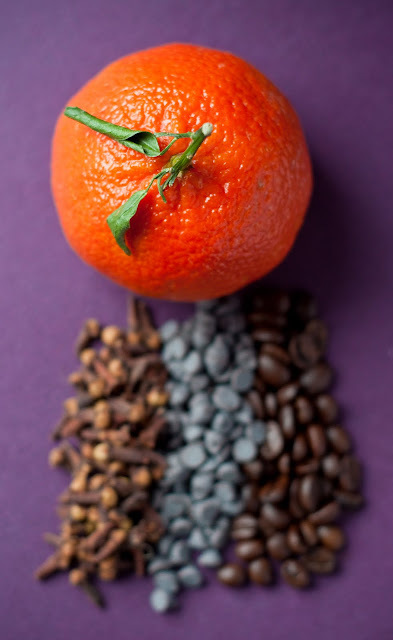 A bold and fragrant blend of juicy orange and spicy clove, a kick of coffee, with just a dash of decadent chocolate mixed in for a sublime start to a wintery, cold weekend. A perfect breakfast in bed. 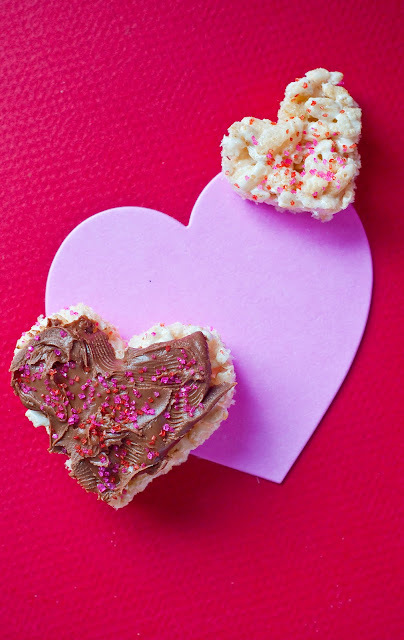 Rice Krispie treats! 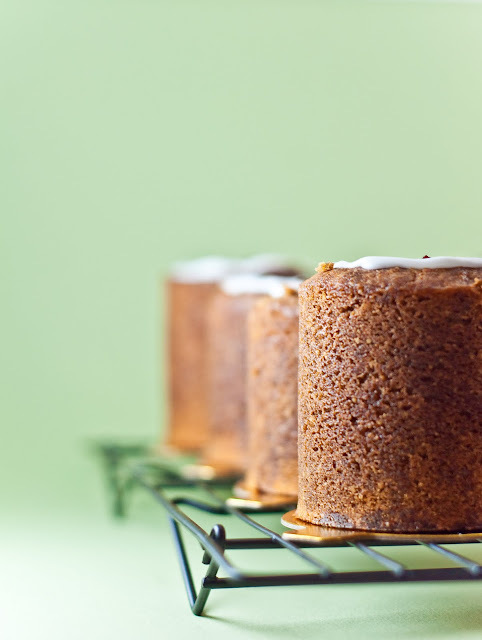 One of the easiest, simplest, yummiest, and quickest treats that you can whip up. Take note: running short on time for Valentine's Day? Rice Krispies literally take, like, ten minutes only. Which is why these things were one of my STAPLE foods in undergrad. Yes, yes, I know. Totally healthy. But, when I needed a quick fix of sugar for late night studying, these definitely hit the spot. 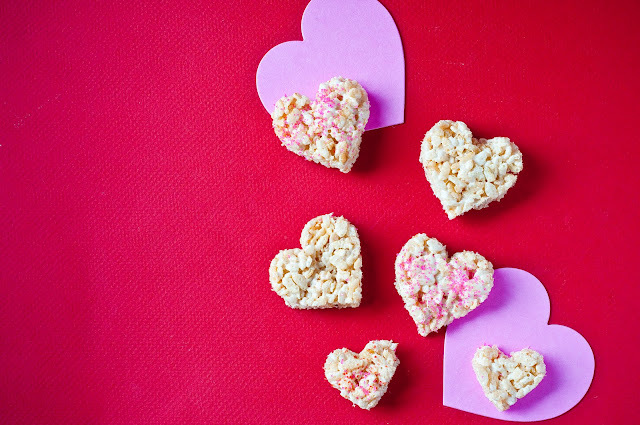 With rice krispies treats, simplicity is most definitely the way to go. Rice krispies with chocolate chips?--too complicated and the textures are too incompatible IMO. 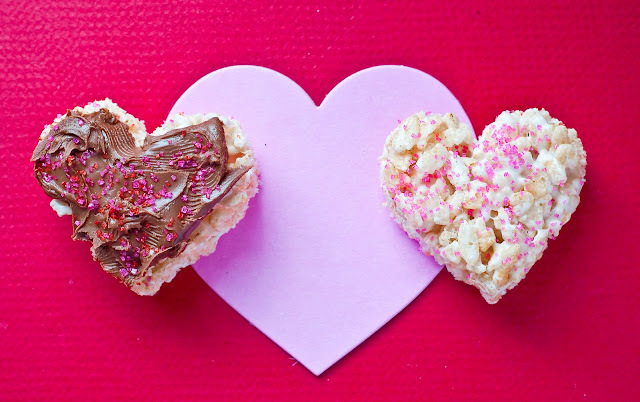 Rice krispies with nuts?--BLECH! 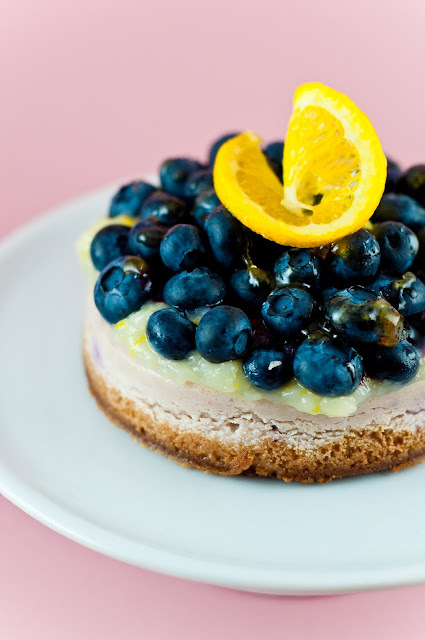 (why try to make a perfectly good sugary snack healthy at all?) Plain is always my preferred choice. Maybe, hit them with a dash of sprinkles to dress 'em up, and you're good to go. 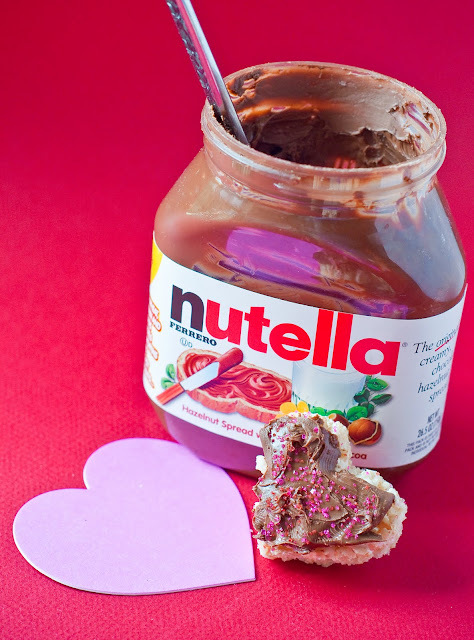 On Nutella Day, take a knife (or any other paste-spreading implement), open a Costco, mega-sized jar of Nutella, grab a big dip of the totally delicious hazelnut chocolate spread, and liberally smooth it all over your rice krispie treat. And enjoy. Yup, life doesn't get much simpler or better than this. Rune..what? Okay, I admit it. 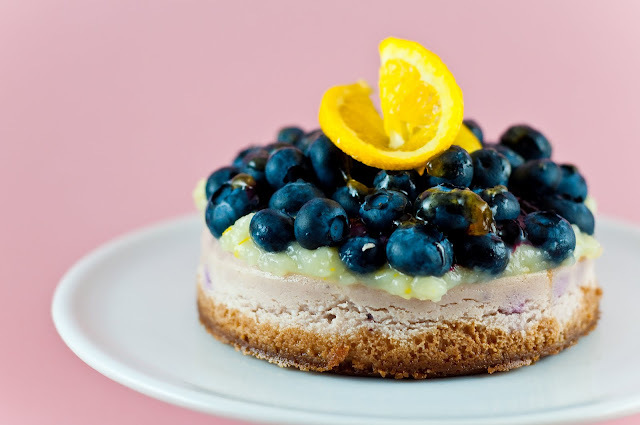 These are not American desserts, but Finnish-Swedish ones. 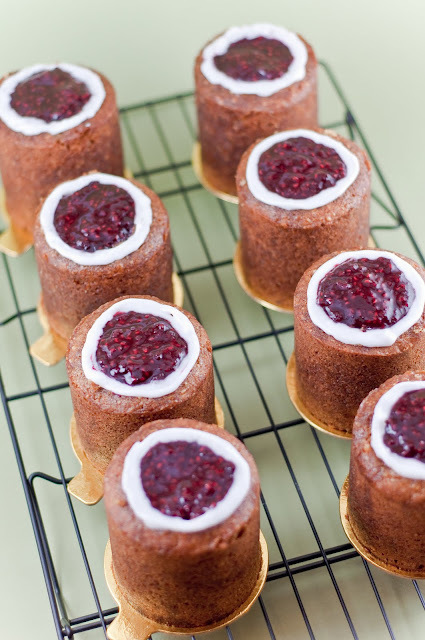 They are named after the Finnish national poet, Johan Ludvig Runeberg, who apparently was especially fond of these cakes (no idea what they were called prior to being graced by Runeberg's fondness), and are traditionally consumed on February 5th, Runeberg's birthday. We have something of a Finnish invasion force in my department. Both my main advisor and one of my secondary advisors are Finnish. Now, to me, that's a lot of Finns in one place. They're even teaming up with another Finnish professor in the Computer Science department this quarter to teach a whole class all about Finnish. So, we hear a lot about Finnish where I am. 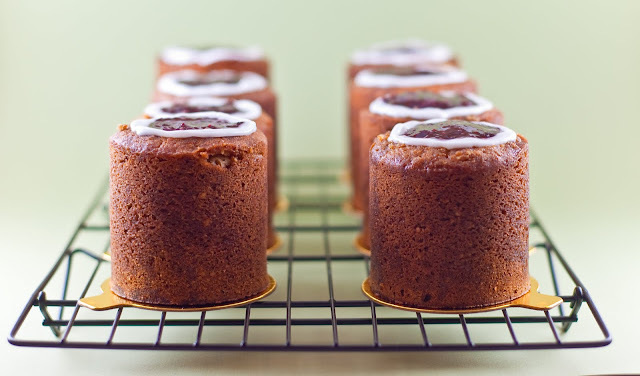 Of course, being the curious academic, I once asked my advisors about desserts that they missed from their native countries (naturally, because I talk about dessert way more than I talk about my day job), and my advisor told me about Runeberg cakes. This was two to three years ago that we had that conversation. Finally, when my advisor's birthday rolled around this year, I had an excuse to try my hand at these intriguing-sounding cakes. They were even more fitting for the occasion because my advisor studies poetics, so why not make a cake named after his country's national poet for his birthday, which is incidentally right around the same time as February fifth? 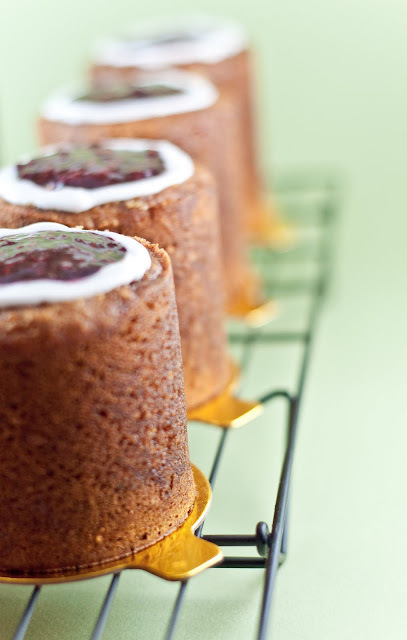 So I did my research, reading up all about Runeberg cakes that I could find. I even attempted some Finnish websites, but gave up very, very, very quickly. (Despite being around Finns all the time, my Finnish knowledge is still nonexistent.) 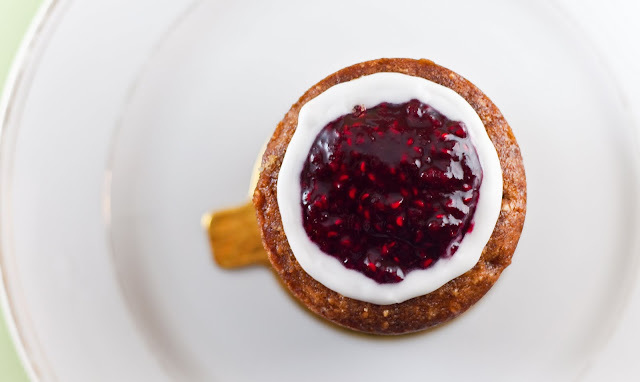 I amassed a bunch of varying Runeberg cake recipes and studied all of them. Finally, I set out to make my own, keeping what I thought were the most important features of the cakes and then adding and adjusting things based on my own baker's intuition (or, however much baker's intuition I fancy myself to have). 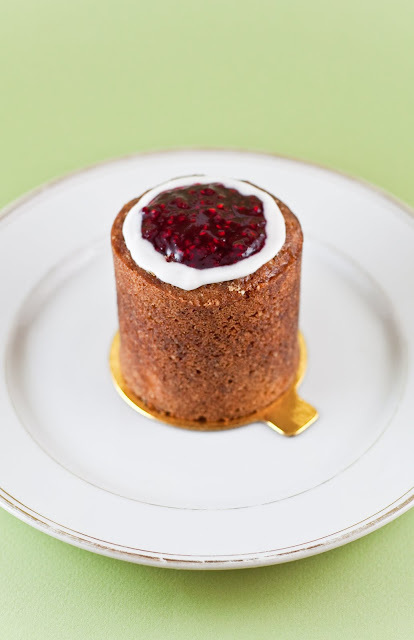 This was the result: a super dense, super moist, super robust tower of individually-portioned cake, packed full of almond, ginger, and orange-y goodness, then topped with a thick and barely-tart raspberry reduction, a dash of lemon juice, and held in by a ring of sweet icing, with just the faintest hint of almond. And boy, it was YUM. But would it pass the true Finnish test? "You should go open a bakery... in Helsinki!"